Work room for Fancy Goods. Office Building, North Family, Mount Lebanon, 1888. All Shakers were matched to some kind of handwork to benefit the community, and appropriate tasks were found for all whether they were young, old, male, female, sick, or healthy. 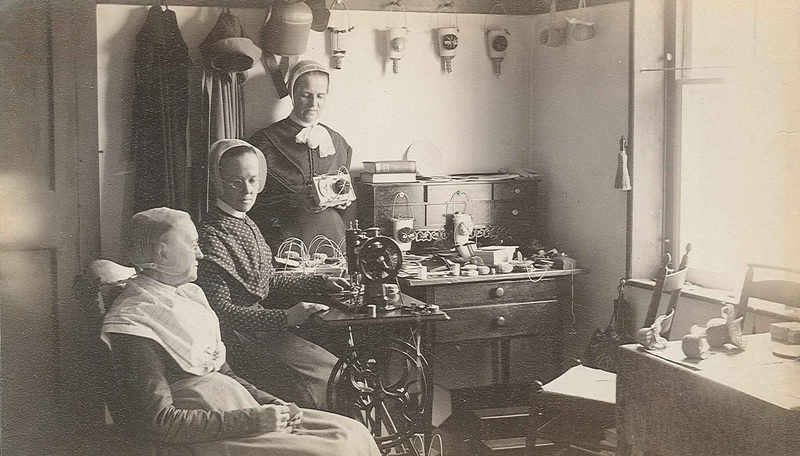 Sisters often, though not always, tended to perform domestic chores – cooking, baking, washing and ironing, mending and tailoring, and housekeeping. 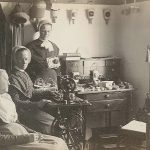 They also spun fiber, wove cloth, and made knit-goods, bonnets, tablemats, and foodstuffs for sale to the public, an enterprise that was an important source of income. The Civil War and increasing industrialization brought about a reduction in the number of men in Shaker communities, and the women took on more and more of the burden of manufacturing items for sale, practically creating factory systems in some communities.